In 1988 I bought my first touring bicycle as a 50th birthday present to myself and discovered that I was above the age that I could contort my body to that ridiculous position, and maintain it on a long tour. I suffered wrist pain, lower back pain, "tokhes" pain (Yiddish for "backside"). I subsequently tried Moulton bicycles, which were then the only touring bikes available with front and rear suspension, but with no relief. There seems to be a fundamental incompatibilty between the seat of a regular upright bike and the human anatomy. I then discovered recumbents, and in 1991 I converted my Moulton AM7 into a Mutant Moulton recumbent bicycle. I was however put off by the unaesthetically long chain and lack of portability of all the available recumbent designs. It seemed ridiculous to me that one would need a van to transport a recumbent to a point of departure, so I decided to design my own. I went to visit the guru - Don Harse, and threw myself at his feet "Teach me" was all that I could utter, and he did. 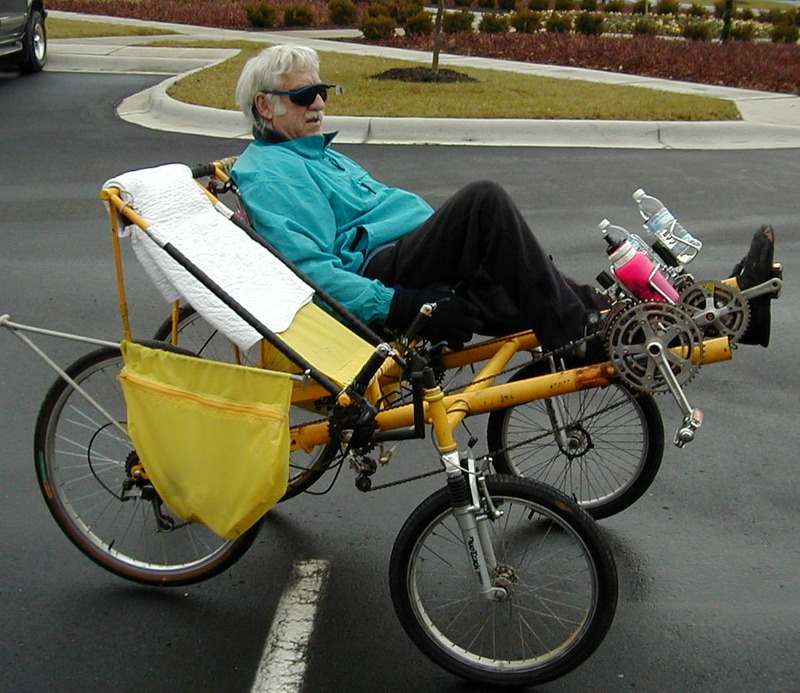 Within a few months I had built my first recumbent design, posthumously named "Legbreaker 1" (1993). Spending a sobering 6 months on crutches I decided to discontinue that series and start the Grasshopper series. Comfort - that requires the recumbent seating position - like on an armchair with wheels. I do not know of any household that uses bicycle seats in their lounge, or around their diningroom table. Portability - the ability to take the bike apart, pack it in a duffle bag, and submit it as an item of luggage. This should not require going to the bathroom with degreasing soap and a change of clothing.